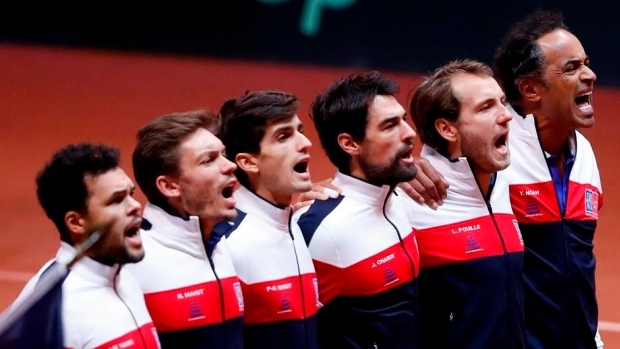 LILLE, France — French players don't like the new Davis Cup format and they're saying it loud and clear. After failing to defend their title this weekend in northern France in a 3-1 loss to Croatia, the French lashed out at future plans adopted earlier this year and Lucas Pouille said he would boycott the competition from now on. This weekend marked the last time in the 118-year-old competition history that the final was played in a best-of-five matches format and over a three-day weekend. Starting next year, the top team event in men's tennis will be decided with a season-ending, 18-team tournament at a neutral site. The International Tennis Federation believes this format, with matches played in best-of-three sets, will be more attractive to elite players who often pass on competing for their countries because of a crowded schedule. The French tennis federation supported the reform. "I'm extremely sorry because of the ITF decision," doubles specialist Pierre-Hugues Herbert said. "It was the last true Davis Cup." Herbert's partner, Nicolas Mahut, said he spoke with ITF David Haggerty immediately after the final to express his discontent. "I believe he understood very well what I wanted to say," said Mahut, without giving details. Lucas Pouille, who was thrashed in straight sets by Marin Cilic on Sunday a year after he wrapped up France's 10th title, said he would not play in the Davis Cup anymore. "Last year I was crying of joy, this year I was crying because I was sad," Pouille said. "I'm not going to change my mind about the new format. As far as I'm concerned, I'm not going to play in the Davis Cup anymore. That was the last time." The ITF said it expects the new format will help generate more money for tennis development around the world. A $3 billion, 25-year deal has been agreed by the ITF with Kosmos, an investment group founded by the Barcelona defender Gerard Pique. Mahut claimed tennis stakeholders should have come up with better solutions. "There are other means to find money. The Grand Slams tournaments could have given some of their revenues and the Davis Cup would have been saved," Mahut said. "We needed to find ways to lighten the schedule, we had so many good ideas to save that competition. There were other solutions." France's Davis Cup captain Yannick Noah, who oversaw his last Davis Cup match this weekend and will be replaced by Amelie Mauresmo, is also a fervent opponent of the overhaul. "It will never be the same, it's going to be something else," said Noah, who guided France to three Davis Cup titles. "I really hope this is not going to be called the Davis Cup. Playing two sets is not the Davis Cup. They are lying. I told (Haggerty) to his face I'm disgusted and upset because this is the way I feel. The Davis Cup was so much for me."